Raise your hands, who likes searching for a job? Yeah, me too. I find it boring, mindless, intimidating, frustrating, and it makes me want to aimlessly wander around in circles. So how can we make this a little more enjoyable? Nerd it out! Well well well, what can we make of those? The Companies folder holds all the companies that I am tracking. 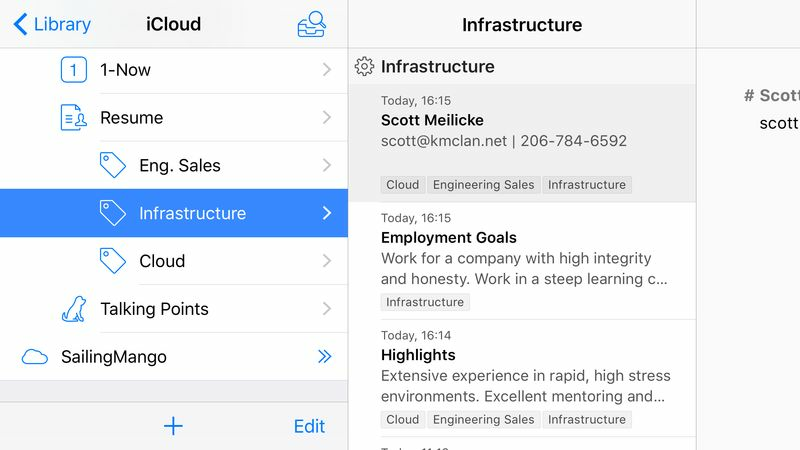 For each job opportunity at a given company, I create a new sheet and store the relevant information such as a URL, job title, and a brief description. I also keyword, or tag, each sheet with a priority, the type of job, whether I have applied, and if the job is still active. 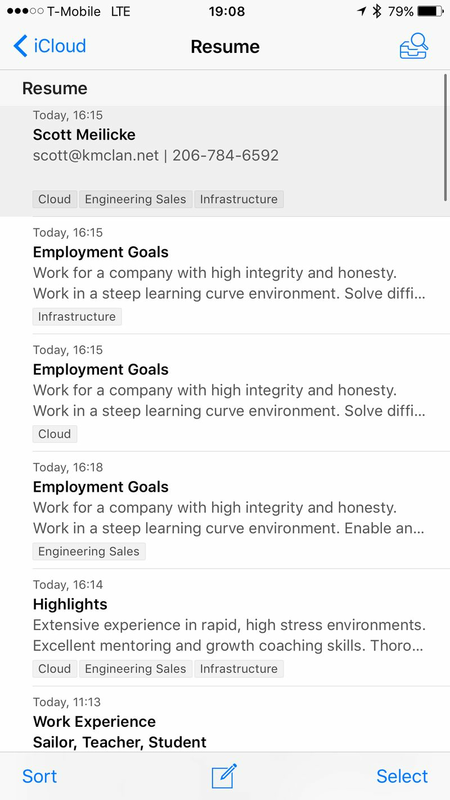 By tagging, I can then search across all jobs to look for jobs I need to follow up with, which are active, high priority, etc., or any other combination. Alongside each opportunity that I have applied for I also include the cover letter for that job. 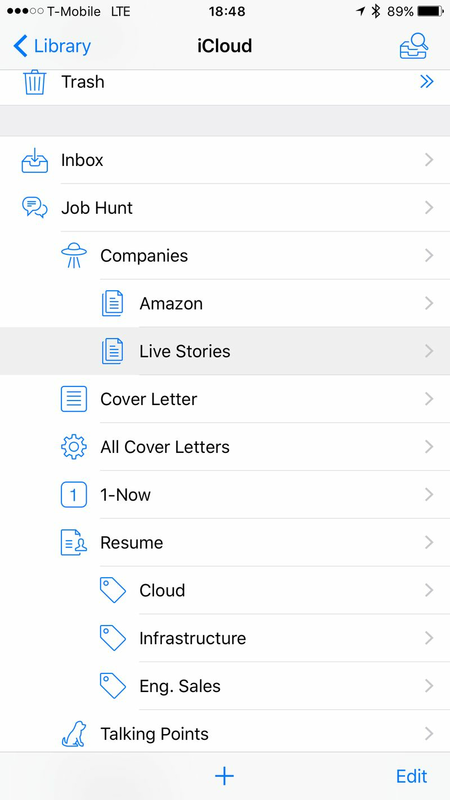 For example, inside of LiveStories is a single opportunity, along with a cover letter that I used for the application. The resume I used is attached to the opportunity, as denoted by the little paperclip icon. You can also see all of the keywords I used. 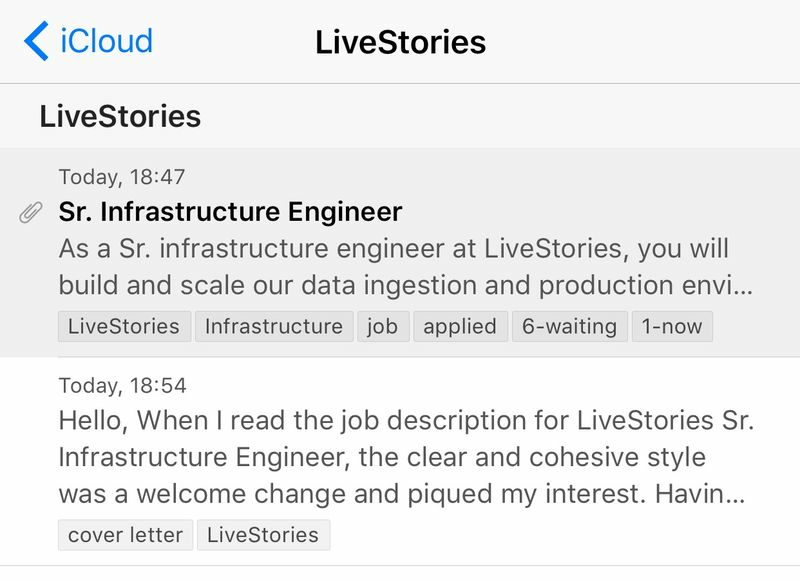 The keywords clearly show that this is an Infrastructure job with LiveStories, I have applied, and it is a high priority opportunity (1-now). The 6-waiting tag tells me I am waiting on someone else to take an action, in this case LiveStories should get back to me at some point, and I can use this tag to go through all of the applied jobs and do some follow-up. 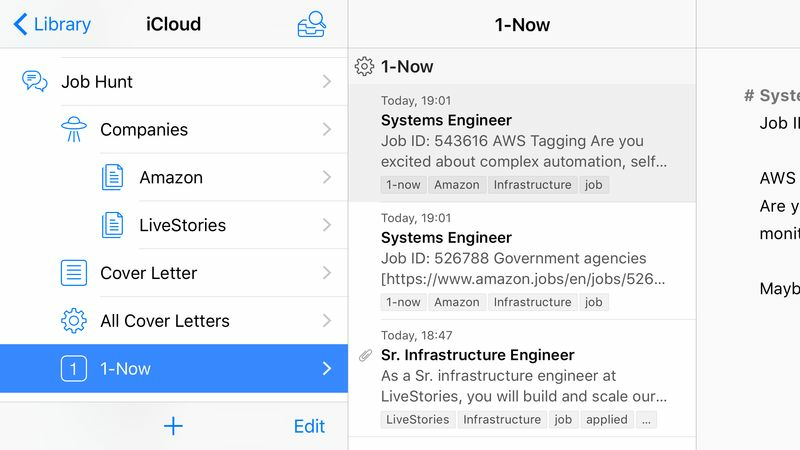 1-Now is a smart folder that aggregates all jobs with a keyword of "1-now", thus helping me to focus on only the most important jobs across all of the companies I am pursuing. I will have to modify the smart folder to exclude those opportunities that are no longer relevant, i.e. too lame to experience my awesomeness on their team. But the real fun of this process has been building my resume. I broke down each section of the resume and put them into individual sheets which are later combined when a full resume needs to be generated. I can then select each section in the filter, and generate a custom PDF of my resume tailored exactly for the job I am looking for. Pretty geeky, right? I'll let you know whether all of this mumbo-jumbo geek massage is of any use. At the very least, I had fun making it. And what is life, without a bit of fun, eh?